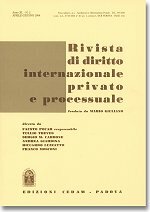 The fourth issue of 2013 of the Rivista di diritto internazionale privato e processuale (RDIPP, published by CEDAM) was just released. It features two articles and one comment. Paola Ivaldi, Professor at the University of Genoa, examines the issue of environmental protection in the context of European Union law and private international law in “Unione europea, tutela ambientale e diritto internazionale privato: l’art. 7 del regolamento Roma II” (European Union, Environmental Protection and Private International Law: Article 7 of the Rome II Regulation; in Italian). Art. 7 of Regulation No 864/2007 (so called Rome II Regulation) provides for a specific conflict of law rule concerning liability for environmental damage, which empowers the person sustaining the damage to choose between the application of the lex loci damni and the application of the lex loci actus. The present article analyses the rationale underpinning the attribution to only one of the parties concerned (the person sustaining the damage) of the unilateral right to choose the law applicable to their relationship, and it concludes that the provision at issue does not purport to alter the equal balance between such parties, as it rather aims at ensuring a high level of environmental protection, both by preventing a race to the bottom of the relevant national legal standards and by discouraging the phenomenon known as environmental dumping. Furthermore, the article compares the specific provision laid down by Art. 7 of the Rome II Regulation with the general conflict of laws rule provided by Art. 4 and Art. 14 of the same instrument, with particular reference to the role played – in the peculiar context of environmental liability – by party autonomy and to the different relevance attributed by such rules to the lex loci damni and to the lex loci actus. Anne Röthel, Professor at the Brucerius Law School in Hamburg, discusses party autonomy under the Rome III Regulation in “Il regolamento Roma III: spunti per una materializzazione dell’autonomia delle parti” (The Rome III Regulation: Inputs for Concretizing Party Autonomy; in Italian). Regulation (EU) No 1259/2010 of December 20th 2010, the so-called “Rome III” Regulation, lays down uniform conflict-of-laws rules on divorce and legal separation. It represents the first case of enhanced cooperation between (part of) the Member States of the European Union, and it became applicable on June 21st 2012. After reporting the criticism of German legal literature, the author points out that the Regulation, although at first sight only aiming at international private law, finally covers substantial matters such as the scope of autonomy when it comes to divorce and legal separation. Her analysis comprises as a first step a comparative view which underlines the existence of deeply rooted legal and cultural differences in the field of divorce. She also presents statistical data regarding the situation in Germany. In this context she highlights the meaning of the “availability” of divorce in the “conservative” legal systems and in the “liberal” ones, that basically depends on whether marriage is conceived entirely as a legal institution or as well as a contract depending on the autonomy of the parties. Secondly, she focuses on Art. 5 of Regulation No 1259/2010 that allows the spouses to determine the law applicable to divorce and legal separation. In this respect, the Regulation goes farther than the existing national rules of international private law. The author questions therefore the legitimacy of party autonomy within private international law. Finally, she examines the conditions for a valid choice of law. The German legislator decided to impose the form of a public (notarial) act for the choice-of-law agreement. The author questions whether the fulfillment of the formal requirements can sufficiently guarantee by itself that the parties are aware of the impact of their decision. She therefore suggests a further judicial control to take place in order to guarantee autonomous decisions in the light of the fundamental rights and the jurisprudence of German Federal Constitutional Court on agreements in matters of matrimonial property regimes. Ester Di Napoli, PhD in Law, “A Place Called Home: il principio di territorialità e la localizzazione dei rapporti familiari nel diritto internazionale privato post-moderno” (A Place Called Home: The Principle of Territoriality and the Localization of Family Relations in Post-Modern Private International Law: in Italian). The way in which space is conceived and represented in private international law is changing. This development reflects, on the one hand, the emergence of non-territorial spaces in the legal discourse (the market, the Internet etc.) and, on the other, the acknowledgment, in various forms and subject to different limitations, of the individual’s “right to mobility”. The interests of States and those of social groups are gradually losing ground to the interests of the individual, the freedom and self-determination of whom is now often likely to be exercised in the form of a choice of law. In the field of family law, European private international law shapes its rules by taking into account the “fluidity” of postmodern society: conflict-of-laws rules become more flexible and “horizontal”, while the “myth” of abstract certainty is outweighed by the quest for adaptability and effectiveness. Indexes and archives of RDIPP since its establishment (1965) are available on the website of the Rivista di diritto internazionale privato e processuale. This issue is available for download on the publisher’s website.